The generator control system is the heart of a utility-scale wind turbine, converting mechanical rotation of the hub into clean, 3-phase power that synchronizes with the utility grid. Keeping these turbines operational and well maintained requires a specialized skill set, and wind turbine technicians possess these skills. They know how to service, operate, and troubleshoot the generator control system, which includes the generator, rectifier, generator control unit, power distribution panel, pad mounted transformer, and generator control software. 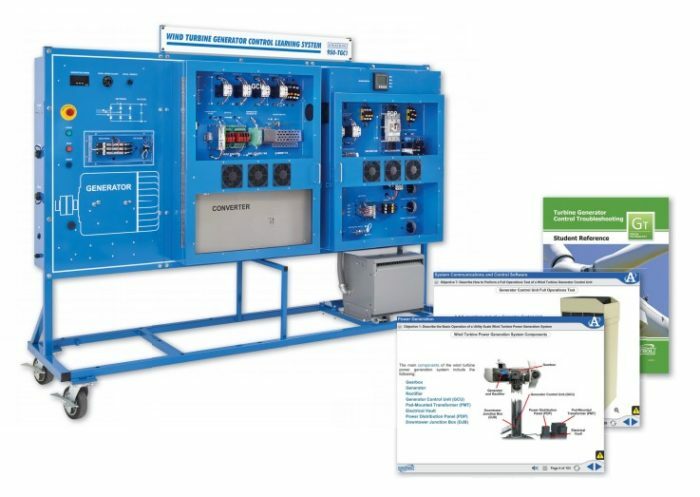 Amatrol’s Wind Turbine Generator Control Troubleshooting Learning System (950-TGC1) allows learners to gain adaptive skills for generator system operation, adjustment, and troubleshooting in a wide variety of situations. It helps learners to develop and practice both wind turbine component and system level skills and gives them the classroom instruction and hands-on experience that they need to succeed in this emerging and growing field. Wind Turbine Generator Control Troubleshooting also includes Amatrol’s unique electronic fault insertion system, which lets learners gain hands-on experience with the troubleshooting of realistic generator control problems, as well as receive automatic feedback on their progress. Furthermore, Turbine Generator Control Troubleshooting connects to Amatrol’s Nacelle and Hub workstations to create a comprehensive wind turbine learning laboratory. Amatrol’s Wind Turbine Generator Control Troubleshooting enables learners to develop operation and troubleshooting skills for wind turbine generator control systems. The system features generator control software that enables learners to start-up, test, and shut-down the wind turbine systems. Turbine Generator Control Troubleshooting includes major components and circuitry found in utility-scale wind turbine generator control systems such as a generator control unit, power distribution panel, transformer, transducers, main line contactor, power factor correction capacitor network, inductive filter, revenue meter, shunt trip circuit breaker, and 3-phase inverter. Troubleshooting skills are essential for wind turbine technicians. At the heart of teaching wind turbine troubleshooting skills is an instructor’s ability to create realistic problems that learners can identify and resolve, because the students will have to troubleshoot at the top of a wind turbine tower, by themselves, applying maintenance skills. Turbine Generator Control Troubleshooting includes twenty-nine (29) faults including six (6) different types of faults: Operational, Bus, Line, Drive, Temperature, and Generator faults. This allows instructors to create realistic troubleshooting situations that a wind turbine technician encounters on the job. Amatrol uses electronic fault insertion so that instructors can easily insert faults and track the learner’s troubleshooting results. Electronic fault insertion prevents component damage and allows instructors to track and target specific areas in which the learners needs to improve. It also allows learners to perform self-directed study. Turbine Generator Control Troubleshooting is an independent learning system. However, it also links to Amatrol’s Turbine Nacelle Troubleshooting and Turbine Electric Hub Troubleshooting Learning Systems. These three combined systems create a realistic operating and troubleshooting wind turbine environment. Fiber optic communications connect the controls of the three systems and control the entire line using the turbine control software to simulate realistic operation on a real wind turbine. With this setup, learners can actually bring the turbine online with the grid. Amatrol’s unmatched multimedia utilizes text, audio, and stunning 3D animations that engage learners in both theoretical knowledge and hands-on skills. This thorough, exceptionally detailed curriculum is built to begin with the basics and steadily advance to more complex concepts and skills. Through partnerships with key industry leaders and leading-edge educators, Amatrol developed the perfectly balance of knowledge and applied skills needed to train learners to work in their chosen field. Connects to Amatrol’s Nacelle and Hub workstations to create a comprehensive wind turbine learning laboratory.